Coworking is a shared office environment where a variety of professionals come together in a community atmosphere to grow their businesses. They are often popular with freelancers, remote workers, independent professionals and entrepreneurs. Over the last couple of years I’ve become a big fan of coworking. The increased connections, learning and community interaction that has benefited me could also enhance many nonprofit executives. Many people think coworking is just for businesses but it can also be perfect for nonprofits. The primary benefit of coworking is the shared cost, so you can have an office for a lot less while still presenting a professional image to your members. It can also reduce your workload and expenses as office maintenance and cleaning will typically be taken care of for you. When you do need to hold a meeting with your board, members or visitors, coworking spaces provide flexible meeting spaces that you can utilize when needed. Each coworking space has its own pricing system and rules. Some have all inclusive membership fees while others may limit access or charge by the day or hour. The biggest benefit of coworking spaces is the opportunity to connect to a variety of people around you. A lively, collaborative atmosphere, can bring new ideas, insights and inspiration to your nonprofit and membership. The inherent networking can bring exciting new opportunities as well. Each coworking space has it’s own personality. Posh Coworking, here in Austin Texas, has an experienced business coach with weekly office hours who offers free guidance to its members. Another local Coworking space, Golab Austin caters to bootstrapping entrepreneurs. The Nonprofit Village in Rockville Maryland is focused around nonprofits. Do you need conference room access? Are you looking for a quiet or social space? Would you like a space that also offers guidance and coaching? Is the location convenient for your board and members to visit? What communal resources do they provide? 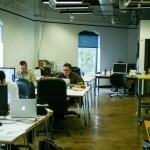 Once you have an idea of your needs visit several coworking spaces. Many will give potential members a 1 day free pass so you can experience the atmosphere before joining. Spend a day working there to see if it is the right fit for you. I suggest you try several and talk to some of the members to get a good understanding of your options. Once you’ve decided you can choose the plan that fits your needs and enjoy the benefits of your new community.